Show your support and gain exposure to OCAPA members and others in Oregon's construction materials industry. Vendor, Sponsor, and Guest Speaker opportunities. Excellence in Concrete Awards: April 25, 2019 - Salem Convention Center, Salem, Oregon. 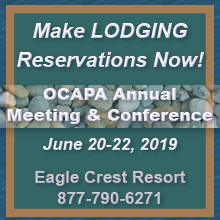 OCAPA Annual Meeting & Conference: June 20-22, 2019 at Eagle Crest Resort, Redmond, Oregon. Give us a call at 503-588-2430 if you would to explore another idea to get your name in front of our membership.